It is that time of year when I start baking for Christmas. It may feel early to some of you but hey it snowed here this weekend so I am ready to get started. This is a delicious crispy, melt in your mouth kind of cookie. They are one of my favorites on the Christmas cookie tray. They freeze well and can easily be made a few weeks in advance of serving. Dipping the tips in melted chocolate would be a pretty variation. Looks like a plate ready for Santa. Cream butter and icing sugar till well mixed. Combine flour and salt and stir into creamed mixture. Stir in pecans which have been finely chopped, this dough will be crumbly but will gather quite nicely into a ball as you can see in the photo. 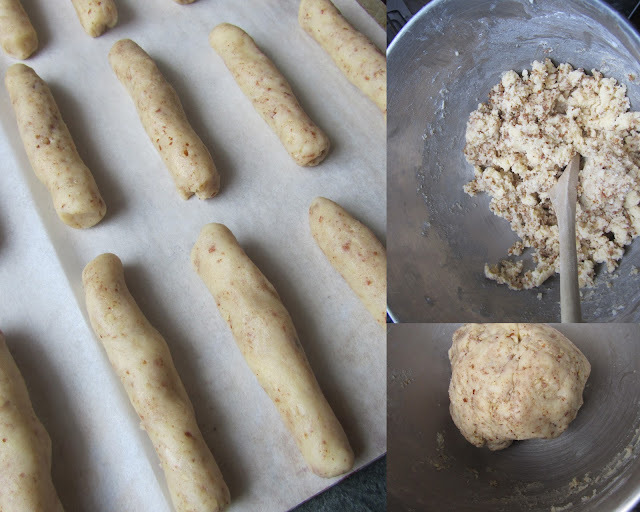 Shape dough into 3" finger lengths. Bake in a 350º oven for 18 to 20 minutes or until lightly browned. Cool cookies for 5 minutes, then dust with icing sugar over top. I used a sieve to do this. These look lovely and yummy. I like that they are shaped differently. They make a nice addition to a cookie tray ! They do look great. A little off topic - I was surprised to see the milk glass, as I have the matching wine glasses. I think I bought them in the mid eighties and have never seen that pattern since. Interesting..I have 1 wine glass like this too. These cookies look so yummy. Definitely going to try these this year. Thanks! Is "Icing sugar" the same as "powdered sugar"? This sounds delicious. Yes icing sugar is the same as powdered sugar. Ohh yumm. I bet they'd be wonderful dipped in chocolate and nuts on one end. Wow, my mum used to make cookies dipped that way and I'd completely forgotten about them! Thanks GQ and Betty! So I'm assuming you freeze them before you put the icing sugar on them? I freeze them with icing sugar on the cookies. I sprinkle the icing sugar on the cookies shortly after baking while still slightly warm, then cool and freeze. Is that one cup of pecans before or after finely chopped? That is 1 cup pecans after finely chopped. These look lovely and I like the idea of shaping them like fingers! Indeed they look like they are ready for Santa's visit :). Yeah! Christmas cookie season is here! These are one of my favorites as well! I wonder how these would taste with one end dipped in milk chocolate! I love these cookies and yes they do taste great dipped in chocolate, drizzled with chocolate, rolled in nuts, -I know this is considered impolite but THESE ARE MY FAVORITE COOKIES EVER!! I'll shout that to the world anyday. The glasses are from the 80's, and besides being in Target, ARBY's gave out wine and water in 2 sizes. The patterns differ only slightly. I find them at Goodwill and other thrift shops frequently. One of my favorite cookies as well! I make something similar - I just use hazelnuts instead of pecans, and (if I'm not too rushed) shape them into crescents. It's my grandmother's favourite! I'm going to make some for her today as a surprise 'just because' gift. My three year old can help :-) Thanks for the inspiration! My next cookie to bake! And I too have glasses like the one pictured. I got mine years ago through Avon.